Taking a family vacation is not family vacation without your new family member. This means you will need to bring the puppy. Your puppy will be so happy to spend time away from the home, but how exactly do you travel with a puppy, and what accommodations do you need to make for your new puppy? These may also be questions you are asking yourself if you need to bring your puppy home from a faraway place. 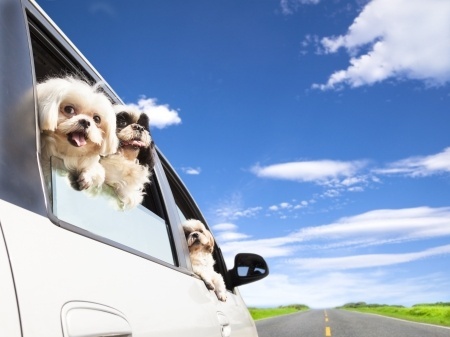 Here are a few tips for traveling with your puppy. You need to buckle up and so does your puppy. There are a few different ways you can restrain your puppy. First is with a specially designed dog seatbelt. You can also put a crate in your vehicle for your puppy to ride in. If using the seatbelt, make sure you buckle them up in the back; they are unsafe in the front seat, and it could even be dangerous if you are in an accident. If you are traveling in hot weather, make sure you never leave your puppy locked up in a hot car. Dogs cannot handle excessive heat, and they could get sick or even die. Make sure you pack your dog a collapsible water dish to use when taking a rest stop. You should also make sure to pack all medications your dog may need. Before your trip, spend time with your pup, making sure they will go to the bathroom when you tell them, or else you may be spending more time stopping than driving.